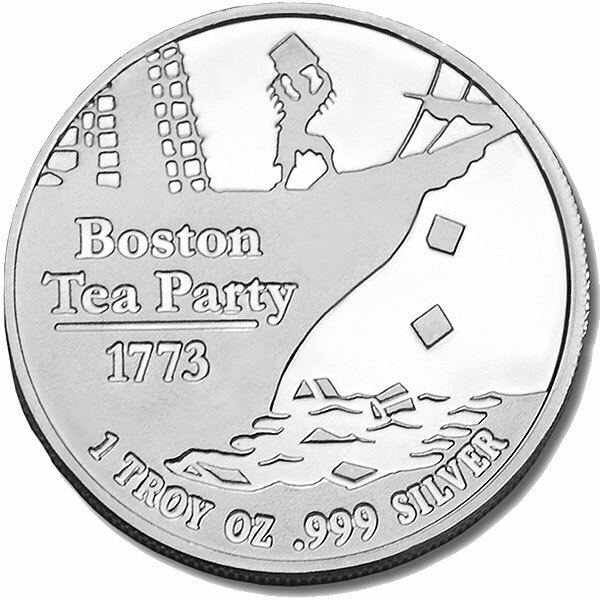 Money Metals Exchange is pleased to offer its popular 1 Oz Dont Tread on Me / Tea Party rounds, minted of .999 fine silver and inspired by the Boston Tea Party of 1773. 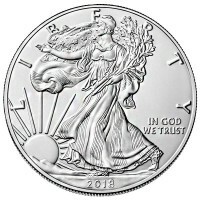 While silver bullion rounds are not legal tender, you get more silver ounces for the price than most other options. 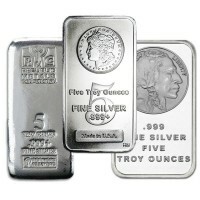 And Money Metals has the best sale prices on silver rounds found just about anywhere. 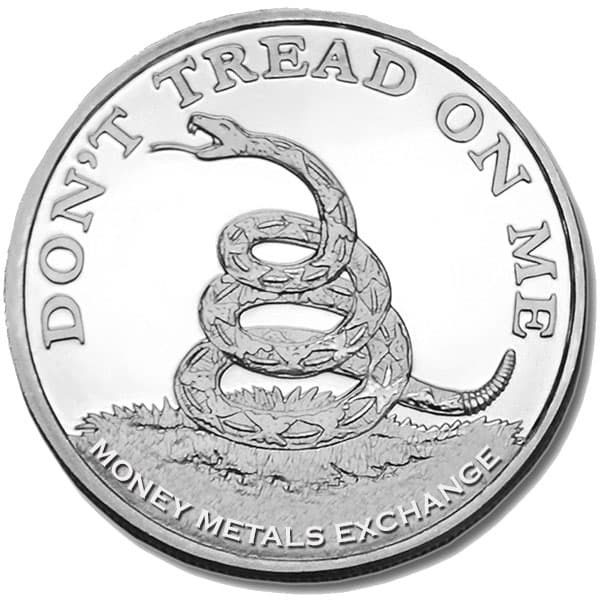 Money Metals Exchange commissioned these beautiful 1 oz silver "Don't Tread On Me" Coins (or "rounds") not only to provide a tool for citizens to protect against the collapse of the dollar's purchasing power, but to help reinvigorate the very symbols of Liberty upon which this nation was founded. These symbols are not to be denigrated and demonized as the highest levels of our political class are now trying to do. Instead they must be renewed, revered, and passed on to new generations who want the Founding Father's principles reasserted in modern-day America. In 1773, hardliners in the British government imposed a symbolic but much-hated "stamp tax" on the restive American colonies. And while the Stamp Tax was small in comparison to today's massive load of taxes imposed from Washington, it quickly became the rallying point that animated and inspired the Sons of Liberty. On December 17, 1773, after 7,000 angry colonists milled around the Boston wharf where British merchant ships were to unload imported tea, a smaller group of 200 chose to act. The Sons of Liberty, some dressed as Indians, forced their way onto three British ships and unceremoniously tossed 342 crates of tea into Boston Harbor. This small act of clever defiance -- coupled with the rattlesnake -- became twin icons of Americans' yearning for Freedom in the face of distant, corrupt, and non-responsive government. Benjamin Franklin's humorous but powerfully symbolic approach to tweaking officialdom is as infuriating to those who wish to control others now as it was then. The spectacle of modern-day defenders of Freedom proudly emulating and popularizing the Boston Tea Party and related symbols is deeply embarrassing to Washington, DC's ruling class. 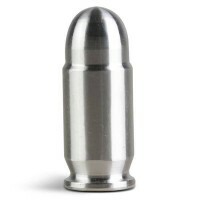 Why Invest in Our Don't Tread on Me / Tea Party Silver Rounds? 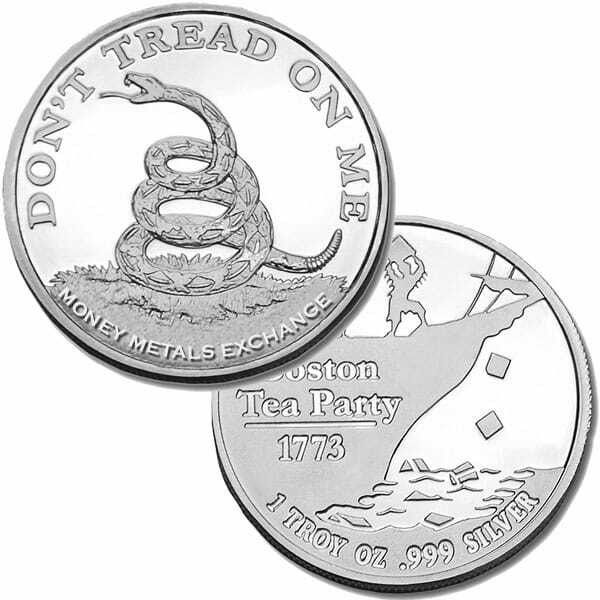 The silver Don't Tread on me / Tea Party coins are a must have for any collector’s portfolio. They are stylish, symbolic, and immersed in American history. The rounds tell a story, not just about how America came to be the great independent nation that it now is, but what sort of characteristics Americans have. 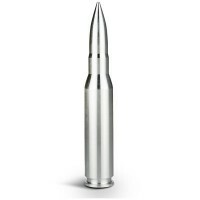 Silver rounds also provide an ideal investment opportunity for people hedging against inflation. In today’s uncertain economy, the strength of the dollar cannot be easily identified, nor can its future. As such, many investors look to alternative sources of wealth, and silver is an ideal form due to its worth and value as a precious metal. 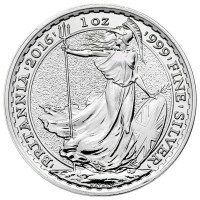 With a purity of .999, the coin’s re-sale value will remain as there is likely to be a constant demand for silver. Silver’s use in jewelry and, as has been reported, medicine, makes it a metal which will always be in high demand. Rounds make a good alternative to both gold and silver bars and coins, as they are unique in size and design, attractively rounding off a collection. Although they cannot be used as legal tender, their value remains and is dictated by the spot price of silver. Just look at a what a bar of silver is worth, or how much you will get when you sell silver coins back to the dealer and then you will understand the value of silver rounds. Why Money Metals Exchange (+ How to Buy)? Money Metals Exchange can offer you a fantastic price on these commemorative rounds, and do so whilst guaranteeing a high-quality service. If you are unsure about anything, simply pick up the phone and call us at 1-800-800-1865. Alternatively, our online help function, connects you with a member of our team of experts instantly. We are happy to answer any questions or queries you may have either before, or after purchase, and we enjoy not only selling products to you at great prices, but educating you along the process. We place our customers at the heart of everything we do, to ensure that you are getting the right product for your circumstances. If you want further re-assurance, why not read some of our customer reviews, on the right hand side of the page? Simply order online using a range of cards, and we will have your product shipped out to you as soon as we can. If you spend over $1000, shipping is free. So, what are you waiting for? 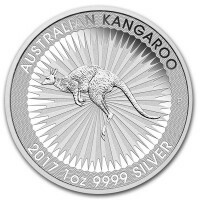 If you decide that now is the right time to cash in on your silver, Money Metals Exchange would be happy to offer you a price, regardless of whether we purchased the silver from you initially (this is another area where we differ from our competitors). Simply contact us, and we will be happy to lock down a price for you. Our current buy pricing is $14.75 each and we will buy up to 10,000 ounces at this price. Simply call us on any weekday to lock pricing at 1-800-800-1865. I ordered 10 rounds from the bargain bin when I received them I was surprised to find there was 10 brand new Don't tread on me rounds. MMX has always been fantastic. This coin has a patriotic design. My veteran friends really like them so I gave them each one to start there own silver stash. The only thing that's missing is that it's not legal currency. But I guess that wouldn't really matter if you were stuck in your country in a crisis, you'd just barter with whatever. Beautiful reproduction of this historic flag. Big bold lettering. Very appropriate for our time today. Nice round. Very well designed. 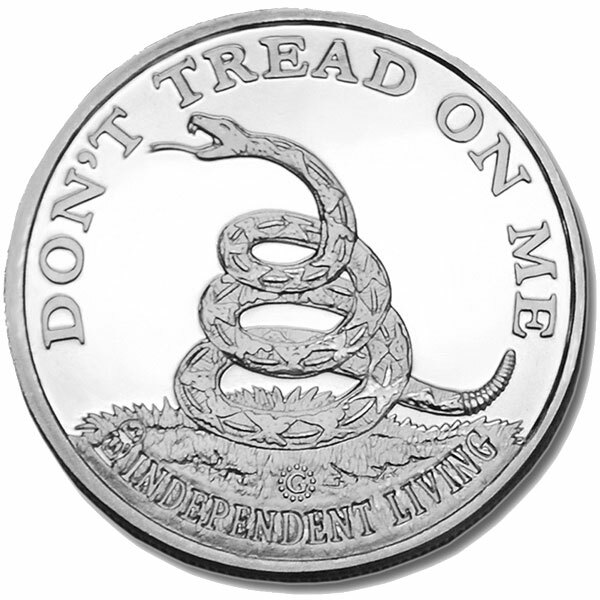 You can now sell your Don't Tread On Me / Tea Party 1 Oz Silver Rounds back to us online, at a price of $14.75 each!